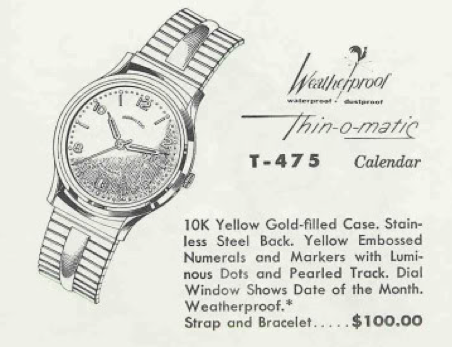 Made for only one year, the 1960 Thinomatic T-475 Calendar is a very cool looking watch that just oozes 1960's styling. The watch is sleek and surprisingly thin. Behind the dial you will find a micro-rotor 668 movement. I don't know that much about these micro-rotor automatic movements... there are several very similar grades ranging from 663, 668 and 666. The latter I think is aptly named as I find trying to reassemble one of these movements to be "the devil's work". Some parts are so small that it's hard to believe they could even make them - let alone that they serve a useful purpose. The case is 10K yellow gold with a screw-on stainless steel back. The dial has embossed numerals and markers with pearlized dots. 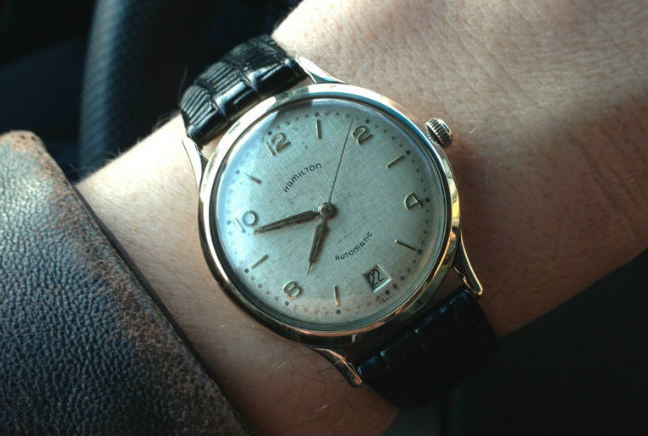 I'm not sure how to describe the textured dial... it sort of has a linen look to it and I'd hate to have to try to get it refinished. The date window at 6 is a very classy touch. Some modern Hamiltons have also adopted this design aesthetic. Thanks for sharing a Thin-O-Matic Dan. I believe I'm correct in saying that Buren produced these movements for Hamilton but I might be wrong. 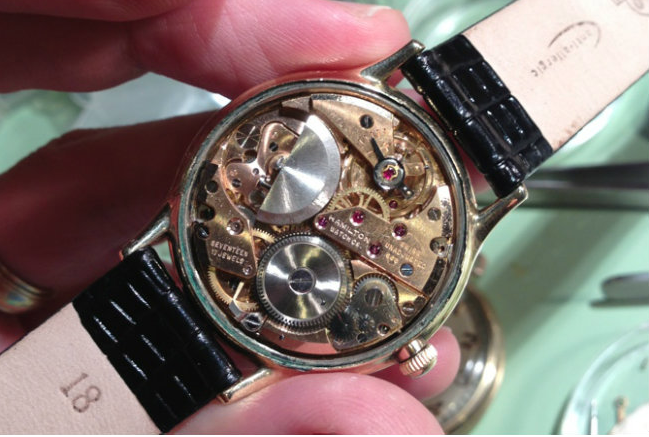 Buren and Universal Geneve both patented (or tried to patent) the technology at around the same time 1954/55. Bruen ('Intra-matic') won a copyright infringement case and UG had to pay Bruen for each 'Microtor' they produced until UG obtained their own patent in 1958. Amazing technology and look so complex - do you have a steady supply of the strong stuff to hand when you work on them?! Yes, I believe Buren was the manufacturer as well. Hamilton sourced all their automatics from Swiss companies which makes calling it "an American watch" somewhat debatable. The other movements are ETA-based. The watch design and assembly was still in Lancaster, PA though. I don't really like these movements to be honest. I've goofed up a couple trying to learn how they work. They have a LOT of tiny parts that are easily broken. Working on them mainly requires a handkerchief - to wipe away the beads of sweat on your forehead while you struggle to put it back together and then later to wipe your tears when you realize you can't. This is one movement that is best left to the professionals. Cleaning our my jewelry box I came across my Hamilton Thin-O-Matic, which I think I got for high school graduation in 1960 (maybe college, 1965?). It looks like the T-475, but the date is at the "3" position, there is a stylized "H" above the word Hamilton, and between the center and 6 is "Thin-O-Matic." The date does not advance; this was a common failure, I eventually quit having it repaired. I just put on after probably 50 years in a drawer, moved my arm to wind it, and it works. Won't know until tomorrow how accurate it is.